Arms and armour stretches from ancient times to modern conflicts, with weapons ranging from swords and clubs to firearms, armour including helmets and shields, and militaria such as medals, uniforms, flags and ephemera. Medals and militaria are often sold at auction as specialised categories, with arms and armour sales also held. The largest battleships ever constructed in Germany posed a huge threat to the Allies. A rare medal group sold in London tells the remarkable story of how one of them was disabled. Once the Tirpitz had been damaged by midget submarines (see main story this section), the German battle cruiser Scharnhorst was left to tackle British convoys to Russia alone. A trap was set by the Royal Navy in December 1943. A 23-year-old paratrooper’s account of escaping the Battle of Arnhem sold for £3200, over 10 times the top estimate at 1818 Auctioneers (20% buyer’s premium inc VAT) of Milnthorpe, Cumbria, on March 5. 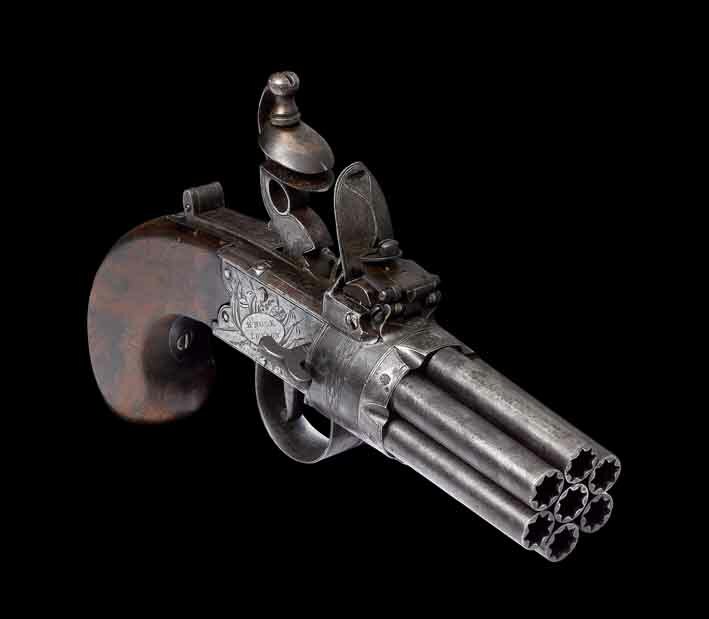 This Chicago Firearms Co ‘The Protector’ palm pistol is estimated at $800-1200 in the Pook & Pook auction in Downingtown, Pennsylvania, on April 13. To this day every Indian officer swears the ‘Chetwode motto’ as they commission into the army: The safety, honour and welfare of your country come first, always and every time. The honour, welfare and comfort of the men you command come next. Your own ease, comfort and safety come last, always and every time. Lawrences of Crewkerne’s militaria auction on May 16 will include an important set of awards and medals to Vice Admiral Sir HT Walwyn. Historic military specialist Michael D Long offers this Victorian Royal Artillery officer’s sabretache and pouch for £785 at the London Antique Arms Fair. Specialist auction house Dix Noonan Webb bought the dedicated Britannia Medal Fair in 2018 from the event’s previous owner, Mark Carter.